Also Note: We are currently raising money to help impacted farmers markets and farmers buy new SNAP payment processing equipment in the event a permanent solution is not immediately found. Please visit our ‘Save SNAP at Farmers Markets’ crowdfunding page to make a donation, and share the campaign widely with your networks. We need your help spreading the word to make it a success! SNAP Outreach Staff assist a family at Crossroads Farmers Market in Takoma Park, MD. 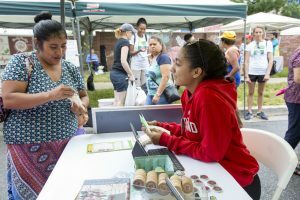 We continue to be deeply concerned by the recent news regarding the shutdown of Novo Dia Group (NDG), and its plans to end service to farmers markets using the Mobile Market+ app and program previously known as MarketLink to process SNAP EBT payments. This news could not have come at a worse time. A disruption to SNAP payment processing services (during the busiest time of year for many markets) would hit markets hard, threaten the prosperity of small farmers, and impact the ability for hungry families to access fresh, affordable food. We also acknowledge the news may dampen spirits that are usually bright and high in the weeks leading up to National Farmers Market Week (Aug 5-11) – a time we dedicate each year to celebrate the benefits of local food and the hard-working farmers who produce it. From 2015 until November 2017, FMC was contracted with the USDA Food and Nutrition Service (USDA FNS) to administer the SNAP EBT Equipment Program. After the program’s contract was put through the government’s standard competitive bid process, a new contractor, Financial Transaction Management (FTM), was selected to take over the program in April. The USDA Food and Nutrition Service issued a statement Saturday responding to the situation, and offered more information about when the program might be up and running. NDG also sent an update to customers on Friday, that clarified that wireless data services will not be terminated early and will remain in place until the 31st along with the app. The news of the shutdown has captured the attention of members of Congress, including Congressman Sanford Bishop, Jr. and Congresswoman Rosa DeLauro who sent a letter Friday to USDA Secretary Sonny Perdue expressing deep concern for the shutdown and how it would impact SNAP recipients, farmers markets, and farmers. New York Governor Andrew Cuomo also sent a letter to the USDA, with “deep outrage” concerning the impact to farmers markets and SNAP customers. Contact your Congressional offices to let them know how you will be impacted by the shutdown. A letter from members of the Senate was delivered to FNS today. What can affected markets do? Markets that want to explore backup options should consider state programs or other local support to cover the cost of new equipment. Click here for information on factors to consider and alternative equipment service providers. Visit FMC’s State Info Guide for info on SNAP and equipment programs in your state. Utilizing state programs to cover the cost of new equipment. For information on your state has a program, see the link above. Mobilizing grassroots efforts/organizations to raise funds for new equipment. Using crowdfunding fundraising platforms to raise funds for new equipment. Reaching out to partners, including local banks the market has a relationship with to sponsor the market and new processing equipment. Read how one market is doing this.